Cleveland's Playhouse Square "Dazzle The District" event can be seen as the accumulation of years of work, which came to a climax at the huge outdoor party on the evening of May 2, 2014. Playhouse Square, as the second largest theater district in the country, was already a significant destination. The new outdoor elements further define Playhouse Square as a Cleveland highlight. Dazzle The District was promoted as a once-in-a-lifetime event, and it lived up to and surpassed expectations! The 19,740 people who attended were truly a part of history. We were moved to see so much pride in Cleveland. It was amazing to see this huge crowd of people smiling, laughing, and dancing in the street! Read more about Dazzle Cleveland! On a cold Saturday night, Stuart and Julie arrived at the theater in excited anticipation! It was another Social Media Night, this time for Deathtrap at Playhouse Square's Hanna Theatre! Stuart had seen the play years ago on Broadway for a college theater class, but had forgotten the details of the show. He only remembered that it was a great show, and he was glad to see it now as a Great Lakes Theater production. We were so excited! This year, in addition to our annual visit to the great Cleveland Winterfest (which seems to be getting bigger and better each year), we were invited for a private backstage tour and viewing of Great Lakes Theater's production of A Christmas Carol. This was a special Social Media Night at A Christmas Carol tour for Cleveland bloggers to learn about the 25th anniversary production of this great Cleveland tradition. On Friday, February 22, 2013, we had a hauntingly good time at Great Lakes Theater’s first-ever social media night. On the opening night of Noel Coward’s “Blithe Spirit,” we were treated to a wonderful evening of martinis, manners, and theatrical mayhem. 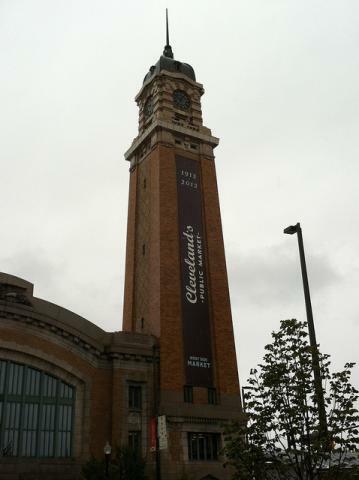 We had a such a great time at the June 2, 2012, Centennial Celebration kickoff for the West Side Market, that decided to visit the October 7th Cleveland West Side Market Centennial Festival before attending the play Anything Goes at Playhouse Square. View our photos of food at the West Side Market in addition to the Centennial Festival activities and artwork creation at Cleveland's Glass Bubble Project. There are also photos of the incredible rainbow we saw while walking from the Playhouse Square Broadway Buzz to the Palace Theatre to see Anything Goes. On Wednesday, July 11, 2012, we were very fortunate to be able to participate in a private tour of Playhouse Square sponsored by the Ohio Blogging Association - Cleveland and Playhouse Square Partners. We saw parts of several theatres that the public normally does not see. It was a fun and memorable evening!